“This was my first pregnancy so of course I read many books about pregnancy. All the reading I had done had one thing in common, they recommended having a doula by your side. I knew my pregnancy was not going to be as easy as I had hoped as I was already classified as “high risk” and been diagnosed with gestational diabetes. Another thing I learned on my quest for pregnancy knowledge is that prenatal yoga is proven to help ease labor. This is how I met Angela, she was my prenatal yoga instructor. Within seconds of meeting Angela her calming, loving presence drew me in. I knew I found someone who could spiritually connect with me. 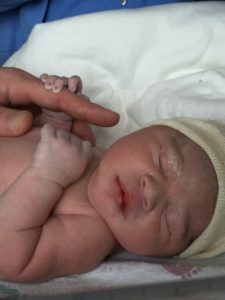 Knowing what I knew about my pregnancy I had my doubts over needing the services of a doula since I felt I had a very high chance of a c-section and it was a big financial commitment with a baby on the way and the uncertainty of how my labor was headed. I cannot tell you how wrong I was! Angela is not just there the day of your labor she does so much more. The preparation and support she provided on our journey to parenthood was invaluable. Come to the Hospital right away! You will be induced and/or have a C-Section! The morning of Tiffany’s birth, the doctor’s office phoned her and told her that she needed to come in right away as they were going to induce her and, more than likely give her a c-section. Her husband was in Los Angeles at work and so he needed to get home asap! I told her I would go with her to the hospital. I suggested that she pack her hospital bag and remain calm using long deep breathing. Meanwhile, I got busy getting ready to go to her. I am not a fan of pregnant women checking themselves in the hospital without their husbands/partners by their sides, unless of course, it’s emergent. When a pregnant woman hears to get to the hospital right away… panic can set in, and that will not help her blood pressure or a calm birthing demeanor. Before Tiffany and I got off the phone, she was calmer and more centered. Amazingly enough, her husband got home lickety split! with that many complications and interventions. Before you read any further, let me just recap her obstacles and diagnosis: 1) High Risk Pregnancy, 2) Gestational Diabetes, 3) Cholestasis, 4) Pre-eclampsia, 5) Threat of a c-section 6) Induction with cervical balloon, and 7) Induction with Pitocin. Not to mention that her husband was not even home when she got the call. He was at work, at least 35 miles away. And I almost forgot, with the Gestational Diabetes, she had her finger pricked every 4 hours or so. As I mentioned, she was induced by two means, cervical balloon and Pitocin (they started them pretty much together). Her dosage of Pitocin eventually got as high as 12-16 milliunits. I remember the nurse looking so baffled, especially considering the fact that Tiffany was in a seated position on the bed and at this point, she was on at least 10 milliunits of Pitocin at the time I took this video. I was so deeply moved by her meditative and calm state of mind and deep breathing. I was propelled to whip out my phone and start videoing. I always ask permission to do this, but this time, I couldn’t help myself, I had to get on the record what I was witnessing! It was absolutely amazing! Many women are “freaking out and laboring out of control” on 2 milliunits of Pitocin. 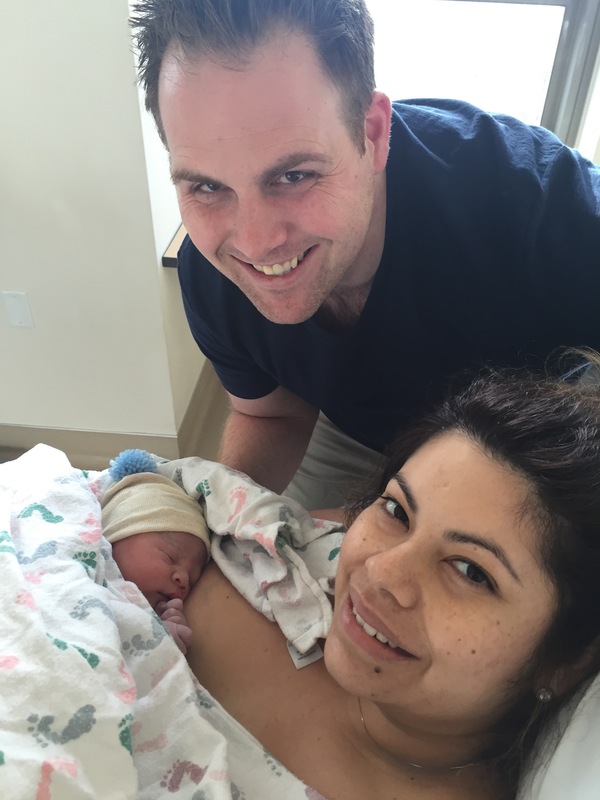 Now… to have one of these diagnosis is enough to experience, to have one method of induction is enough to experience, but to have them all without an epidural, and for Tiffany to successfully manage her birth the way she did, is absolutely incredible! See for yourself, turn up your volume. is a testament to her commitment to her birth intention and vision; her state of mind and willingness to be in the present moment as new and unexpected things arose, (as can happen during labor and birth). One of the things I emphasize to my clients throughout their pregnancy is, for them to keep their attention in the present moment, make a new decision in the moment with the information they are given. Tiffany was good at this. Her intention was to labor at home as long as possible, well… that was immediately thrown out the window when the hospital called, saying “Come in right away!” I remember telling her over the phone, lets deal with what is in front of you right now, get the bag packed and stay present with your breath and eat something before you go. You do not know if you will have a c-section. I reminded her that they would start with induction first. I also reminded her to choose from the least invasive procedure first then progress onward as she intuitively felt was safe for her and baby… and weighing that with her doctor’s recommendation. even as she was connected to multiple IVs and medications. I know for a fact that the nurses and doctors were expecting her to eventually have a c-section. One of the nurses told me this later, they were concerned. But here is the deal, the baby’s vital signs and Tiffany’s vitals were within normal limits. I contribute this all to her calm demeanor and to the fact that she did the spiritual work, felt loved and supported by her husband, as well as by me. Also, a huge bonus in their favor, few people knew they were at the hospital, so they were able to labor and birth in peace. They also knew to turn their phones off or volumes completely down. They made a conscious decision to remain connected to each other and their baby. 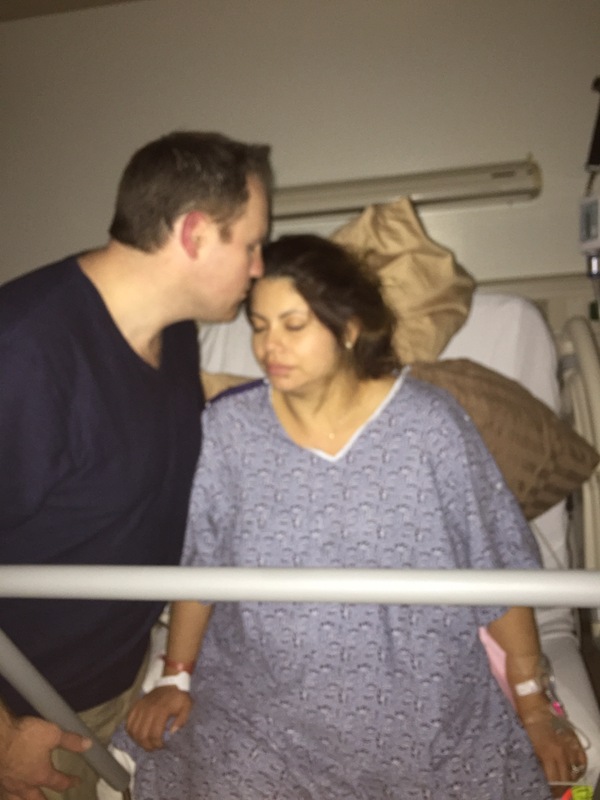 Tiffany is in the Transition Phase of labor here. She is getting close to the pushing stage of labor, hence, the squat bar is up in front of her. This is how she rested down between contractions and pushes. Her final pushes were in a semi-reclined (sub-pined) position on her back, with legs up, as she had better results in this position. She pushed about 45 minutes. that Tiffany had received an epidural. When he came in the room, she was pushing, he determined all looked well and went to make other rounds. He was under the assumption that she would take a while to get the baby out, it being her first baby and all and he was “assuming” she was medicated with an epidural… not the case! There is the perception around natural birth that a woman will be screaming her head off and birthing out of control! When a woman knows her power, she does not resist her body and welcomes the descent of her child through her womb. This kind of woman can and will experience birth more peacefully and calmly. Tiffany had trust and faith in herself and the birth process, yet she still weighed the doctor’s professional opinion. Her inner strength, mental fortitude and meditative mind allowed her ability to remain calm and in the moment. The love, tenderness and compassion that she and her husband demonstrated to one another was paramount for them in experiencing such a beautiful birth, despite, the odds against them. She made one decision at a time. She did not get caught in the mental trap of thinking, “but I’m not having the ‘natural birth I envisioned,’ ‘this is not what I wanted,’ ‘this is just too much,’ ‘I’m too tired, I can’t do it.’ ‘I can’t deal with this, etc. etc. etc.” This kind of thinking can flood one’s mind and body with emotional and physical resistance to what is happening in the moment. 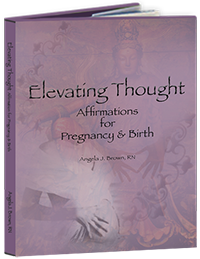 May each of you reading this story, who are pregnant, experience your most powerful birth. You have the love and power to birth naturally, may you recognize this love, and the power within, and as you, and choose it. that Tiffany did during her pregnancy, was honor her regularly scheduled Pregnancy Life Coaching (“PLC”) sessions with me. Pregnancy Life Coaching sessions provide pregnant women with an opportunity to voice their concerns and worries about pregnancy or anything else, in a safe environment so that they can become clear about their choices and feel uplifted after the session. Spiritual homework is given to each woman so that she is able to keep herself centered and balanced throughout her pregnancy. Tiffany called me on a few occasions in tears and very upset with her doctor. Her doctor actually told her she didn’t need a doula! (Cue my eye roll, over the phone, of course). I actually like this doctor, he refers to me all the time; however, he was incorrect in her situation. I listened intently to her as she shared her experience she had with him, we talked it through and I reminded her of what her birth intention and vision is. I also gave her some coping skills and techniques that would help her rise through frustrations she had about her doctor; as well as, helped her rise through her own fears about birth that were showing up. I work with women who hire me as their doula as well as with women who do not hire me as their doula. If you are interested in Pregnancy Life Coaching Sessions and believe they could support you at this time in your pregnancy, please feel free to contact me to schedule an appointment. Tiffany’s doctor came flying back in the room and barely had time to gown up before he caught the baby. He said, “I forgot she didn’t have an epidural, she’s so calm.” Women who do not receive an epidural, push their babies out organically, powerfully and faster. You can do it MAMAS! Keep the faith! Trust yourselves and get the support you so richly deserve!